Colic what is it and how can you help your baby. Colic is simply distress caused by a digestive issue, there are lots of different types of digestive issues some more serious than others, they can be categorized as Standard Colic, Reflux, Gut Irritability, Lactose Intolerance and Other Allergies. It is worthwhile knowing the different types and identifying which type your child has – if for example it falls into the category of lactose intolerance and your baby is on formula that contains lactose then a change of formula can be very effective as a solution. What you as a parent can do to help your baby? These are described below in some detail so if you are really keen to avoid giving your baby drugs & you weren’t aware that there were other option you might want to just scroll down past the drug section. There are various drugs that can be prescribed by your GP. Zantac is one that is commonly used. Sometimes it works sometimes not (see Genetics- why certain drugs won’t work for certain types of people) and if drugs are going to work then you should see a difference within 1 week, and definitely within 2 weeks. The reports I get from parents is that 3 days in and you should already be seeing a difference, if not then it is unlikely to work. Prescription drugs like Zantac effect the way the stomach pumps in order to restrict how much stomach acid is produced. Zantac is the trade name for Ranitidine, other drugs you might have prescribed that are similar are Losec or Prilosec (Omeprazole) and Zoton or Prevacid (Lansoprazole). Other drugs that are commonly used are anti-acids, the most popular in Australia being Infacol, Infacol contains the drug simethicone and it aims to reduce stomach gas. The active ingredient tries to encourage bubbles to join together in order to make it easier for baby to bring them up as a burp. The theory being that this will reduce the amount of air that enters the intestines. Other antacids such as Gaviscon work in a different way by coating the stomach with a barrier of gum, they are often effective with adults but as a upright position is needed to make the drug effective the drawback of using Infant Gaviscon is obvious. It also has high aluminium & sodium content so it isn’t often recommended. Homeopathy has various remedies that are used for colic. These can be prescribed on an individual basis by visiting a homeopath who will take a case history & make up a remedy that is tailored to your baby. Some parents report great results and others have seen no change, I think a lot depends on which homeopath you see so a word of mouth recommendation is probably the best way to go. 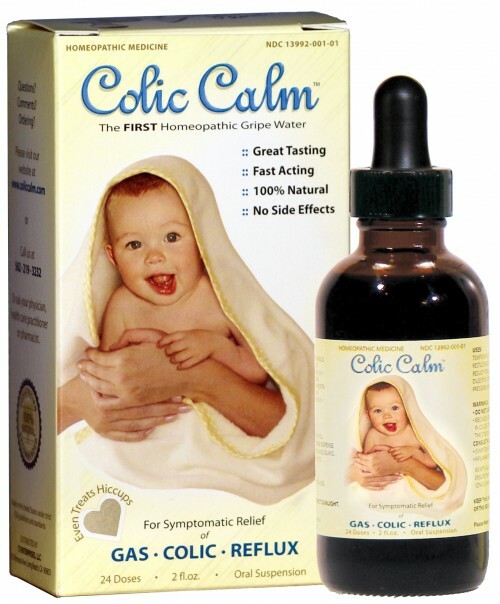 Colic Calm is a homeopathic Gripe Water remedy that is produced by TJL Enterprises in the U.S. it is one of the most successful gripe waters on the market although as with any remedy it won’t work for all babies. However, their website says that it has been used successfully by more than 500,000 parents & there are about 1500 testimonials from parents on the site. As all its ingredients are at ‘homeopathic’ dose (i.e. so small to be almost non detectable) Colic Calm won’t have any side effects and as it’s about $25 for a bottle it is cheap enough to try as your first line of attack (You can order it online). There are other gripe waters that you can buy from the chemist e.g. Brauer’s Colic Calm, occasionally parents report success with them but more tend to report the opposite. However as I treat lots & lots of babies with colic I will be seeing the babies who the drugs & remedies haven’t worked for rather than the ones who it has worked for! Physical Therapy – this may conjure up images of moving and ‘cracking’ joints, especially if you have had that style of treatment yourself. So the thought of allowing this to happen to your little baby may not delight you! However, there are styles of treatment that are extremely gentle and involve gentle work on the cranial bones or gentle ‘unwinding’ of areas in the body that have been subjected to strong birth forces. So although there are practitioners that adapt their adult style of ‘clicking’ joints and apply it to children, this is not our approach as our focus is on gentle treatment that has sometimes been called ‘cranial’ or cranial sacral therapy although this cn be misleading as what we do is certainly not limited to the cranium. Children and babies can be difficult to treat, they move around a lot & cry! One of the reasons for this is that a baby’s nervous system differs significantly from adults. A baby’s nervous system is still very immature so very often treatment to calm this nervous system down is a key part part of treatment – especially for colic. To do this very gentle techniques are needed as sudden movements that might cause baby to be alarmed will often ramp up the nervous system rather than calm it down. So what does your treatments focus on? To make this easy to read for the non medical world I have not used medical terms, and I have restricted the article to 3 areas but if you do want more detail please leave a question in the comments section. There are 2 nerves that travel from your brain all the way down your body to your stomach and upper gut, these nerves help control your stomach & digestion. When you are a baby the bones in the skull are soft and can move. If these bones have been moved during the birth process or from ‘moulding’ inside the womb then it is important for us to check and treat this area. This is the big muscle that spans your body & divides the guts from the lungs. It helps you breathe by moving the lungs up & down. Often during the birth process, baby can be distressed & if this happens it can effect their breathing. Remember what happens to you when hear a sudden noise or have a sudden shock, you take a big breath in & hold it. Try it yourself now to remember what it feels like. If your breathing is effected then it is likely that this will influence your diaphragm. This article was written by Dr Jonathan Evans, a Registered Osteopath who has provided babies and children with thousands of treatments over the last 14 years of clinical practice. This Article “What is Colic’ is the copyright of the author Dr Jonathan Evans. Dr Evans is a Registered Osteopath who works in the field of children’s health and in particular focuses on the treatment of babies and young children in the Gold Coast & Tweed Heads regions of Australia.